Concrete Embedment Liners are ideal for protecting concrete from harsh environments. The thick sections of polymer are resistant to most acids, bases, hydrocarbons, vapors and microbiological materials, which are all environmental factors that can degrade concrete over time. Concrete Embedment Liners can be installed onto existing concrete structures with the addition of a layer of grout to hold the liner in place. It is also possible to line a concrete vessel with a double layer system to allow for leak detection. There are 6 steps in the installation of Concrete Embedment Liners; erecting the forms, lining the forms, placing the rebar, pouring the concrete, stripping the forms, and welding and testing the lining. Erecting the forms is normally done in different stages. The manufacturer's instructions for each Concrete Embedment material will give clear details about how the material should be placed into the forms. 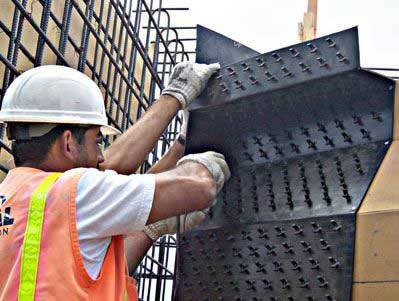 The reinforcing bar is placed in the form after the Concrete Embedment Liner. The manufacturer's instructions are to not attach the rebar to the Embedment sheet in any way. Once the concrete is poured, it needs to be vibrated in lifts so that there are no void spaces behind the Concrete Embedment Liner. Once the design strength of the concrete is achieved, the forms can be stripped. The seams in the Concrete Embedment Liner are extrusion welded and tested for any leaks. Allowed to cure, and the forms stripped.